While not particularly mathematical, or algorithmically correct, this formula is absolutely true AND absolutely dependent on one single factor… practice! Without home practice the entire formula falls apart. The key addition of course being “involved parents”. Much of your piano studio’s success hinges on this one single factor. Which is why, when we work with piano teachers, one of the first things we advise is to strive to help parents be active participants in the piano lesson process… even if they have absolutely no musical background. But it doesn’t have to be this way. 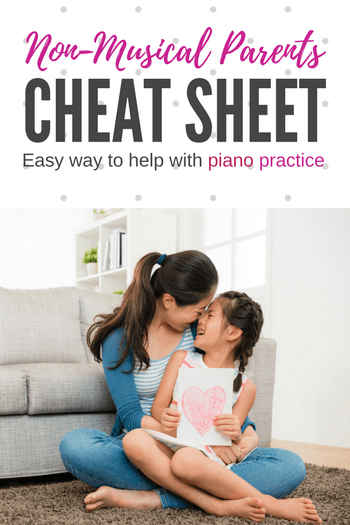 By simply sitting with their children for the first 5 minutes of a practice session and using our Piano Parent Cheat Sheet, not-so-musical piano parents can have a huge impact on their children’s musical success. Laminate the following question cards and send them home with your not-so-musical piano parents (note… we’ve also included a blank set of cards so you can customize your own set of questions). Ask them if they would mind sitting with their children for the first five minutes of daily piano practice and having a little chat… using the question cards as a jumping off point for the discussion. And then, wait for your students to return the following week. If their parents have indeed taken a few minutes of their day to get involved with piano practice, I’ll bet you’ll see some serious progress… which, in the long term, means serious success for you! Hopefully, you’ll have piano parents that will run with the idea of daily practice participation. If this is the case, then check out our newest resource, TEDDtales – Technical Exercises, Dramatically Different. These story-based technical exercises are the perfect activity to involve any piano parent, regardless of musical ability. Parents will experience some serious bonding, daily practice will be a riot, and, best of all, your students will not even know they are doing those important daily technical exercises!